This is the pasture inventory method popularized by folks in adaptive grazing or management intensive grazing. It’s practical and only requires your boots, eyeballs, and some quick math. Go out to pasture and pace off a square patch of pasture that you think will feed one Animal Unit (AU) per day. For reference, one standard Animal Unit (AU) is a 1000 pound steer, eating 3% its body weight per day. This would be 30 lbs of dry matter per day. So this patch is going to feed one Animal Unit Day, or one cow-day. Measure by paces how big your patch of pasture is. Count how many square yards your paced-off patch is. For example, 20×20 yards is 400 sq yards. Divide to find how many cow-days one acre has to get Stock Days / Acre (SDAs). One acre has 4840 sq yards per acre. In this example, 4840 sq yards / 400 sq yards = 12.1 Stock Days/ Acre. Stock Days / Acre (SDAs) or Animal Days / Acre (ADAs) is a measure of how much grass you have. It’s an indication of forage inventory and carrying capacity. You can use SDAs to calculate an appropriate stocking rate for your animals. Once you’ve trained your eye, it will become easier for you to better at eyeballing SDAs on your pasture over time. PastureMap helps you calculate animal days / acre (ADAs) actually grazed on each pasture as you put in grazing records, so you can always keep track of how much carrying capacity your pastures can support. Over time, you will get a much more accurate sense of how many ADAs you actually got out of your pastures. Ready to try taking pasture inventory? 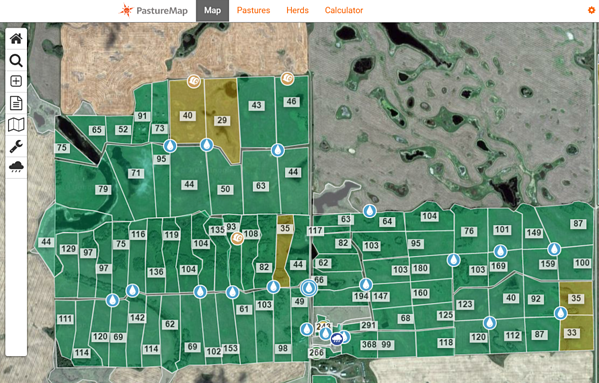 Start a free trial with PastureMap to instantly calculate stocking rate and carrying capacity in the field. Read more on the next step after pasture inventory - how to use ADAs to calculate stocking rate and carrying capacity. If you’d just like a quick, but less accurate estimate of your pasture dry matter, all you need is an estimate or measurement of the forage height. Once you have the average height in inches of the forage in your pasture, multiply it by 200. This is an average estimate of pounds of dry matter per acre per inch of forage height. For example, if your grass is 10 inches tall, multiply 10 x 200 to get 2000 lbs/acre of dry matter. If you want to get a little more precise, use the table below to estimate. Just replace 200 with the relevant number below based on the type and health of forage you have in your pasture. A grazing stick is a tool that can be used to obtain a more accurate estimation of the dry matter of your pasture. To use this method, first you need a grazing stick. While the various grazing sticks may be slightly different, the process remains the same. Measure the height of the grass. Estimate the percent of the soil covered by forage next to your measurement. This is usually grouped as <75% cover, 75%-90% cover, and >90% cover. Look at the chart on your grazing stick, and determine the pounds of dry matter per acre inch based on your cover percentage group, and the type of forage growing. Multiply this by the height of the forage to get pounds of dry matter per acre. Input this data into PastureMap to track your pasture health over time. The pasture inventory estimates on grazing sticks vary based on area, so look to your local NRCS for one designed for your region. Try this link to find your own regional grazing stick. If you want precise measurements, you can actually go out into the field and use clippers to harvest the forage from a square foot of land, cutting just above the soil. Then, weigh it and convert to lbs/acre. If the forage is not dry, be sure to multiply the weight by 0.2, assuming the grass is 20% dry matter. You may also choose to throw the forage in an oven or microwave to dry it out. With all these methods, the more points you sample the more accurate your inventory will be. In uniform pastures, fewer measurements are needed, but in a pasture with varied forage, you might have to take five or more sample measurements to get an accurate result. Likewise, practice makes perfect. Try out all of the methods, and see how they compare in ease and accuracy. Which one works best for you? Remember, the most important part of taking a pasture inventory is making sure to repeat the measurement often so you can see how your pasture productivity is changing over time. Looking to improve your pasture monitoring? Sign up for PastureMap to take advantage of pasture inventory records to tie grazing practices to forage and animal productivity. Table from Iowa State University, University Extension.